Maharashtra Chief Minister Prithviraj Chavan on Tuesday indicated that the border dispute over Belgaum with Karnataka is not a "closed chapter" and said the two States would abide by the Supreme Court verdict on the issue. Asked if he subscribed to the consensus across political spectrum in Karnataka that the Belgaum dispute is a "closed chapter", Chavan told reporters: "We all agree that there is a dispute". He said both Maharashtra and Karnataka governments have agreed to abide by the final decision of the Supreme Court, before which the matter is pending. 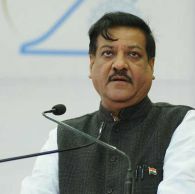 On Maharashtra Home Minister R R Patil's "provocative" speech in Belgaum on April seven, for which the Election Commission later pulled him up, Chavan said the former's statement was "misunderstood". An FIR has already been lodged against Patil by Karnataka police on charge of promoting enmity between different groups on grounds of religion, race or language. The EC said Patil's speech prima facie violated the model code of conduct and also Representation of People Act. Chavan said he spoke to his Karnataka counterpart Jagadish Shettar, requesting him to withdraw the FIR but the latter told him it had been filed on the directions of the EC (and hence cannot be withdrawn). Belgaum bordering Maharashtra has a sizeable population of Marathi-speaking people, and had for decades been a bone of contention between the two states. Asked if he thought Karnataka is taking care of Marathi-speaking people in Belgaum well or whether they were discriminated against, Chavan was evasive and did not give a direct reply. He said Marathi-speaking people are a minority and they have constitutional rights, adding, if they have any grievances on this front, they can approach the appropriate forum -- National Minority Commission in Delhi.